Back in the vintage era when they referred to ham it was what we call "Country Ham" or "Virginia Ham" today. These hams are heavily salted before smoking and are not injected with any flavorants or water to make them juicy. Sometime in the 30's though Swifts brought about the ham revolution with the more modern process of injecting their hams with flavors and pre-baking them. It was a great time saver over the older method of cooking a ham which involved soaking and par boiling the ham to remove some of the salt before baking in the oven. Swifts hams also were juicier than the old country hams because they were not smoked and dry cured. All this convenience has a price though as the flavorings injected are quite artificial and over the years Americans have developed something of a sweet tooth when it comes to ham so increasingly large amounts of sugar have been added to hams with the sugar eventually being replaced by High Fructose Corn Syrup by some companies. I remember when I was a kid and ham tasted like ham, a bit salty, maybe a slight bit sweet but not cloyingly so. Today though everyone seems to want to copy Heavenly Hams and their overpriced sticky sweet monstrosities. If you hunt around you can still find country ham, usually in slices but if you're lucky you may stumble upon a whole one. These hams need to be parboiled 5 minutes a pound then let to sit several hours before removing and rinsing. Score the fat and then cook in a moderate oven for about half an hour before serving. Beat the egg then cream in the sugar and milk. Sift together dry ingredients. Add melted lard to egg mixture then fold in dry ingredients and mix thoroughly. Mixture will be tacky and soft. Flour a board well and place mixture on it, flouring top well. Roll out to 1/4" thickness then cut with doughnut cutter. Heat oil in deep pan (I used a chicken frying pan). Try a piece of scrap dough in it, it should brown on one side within 1 minute. Fry doughnuts in batches turning after 1 side is well browned. Drain over newspaper and dust with powdered sugar and serve warm. Alternately you can dredge warm doughnuts in cinnamon sugar. Eastern European countries have many ways to cook cabbage and pork. 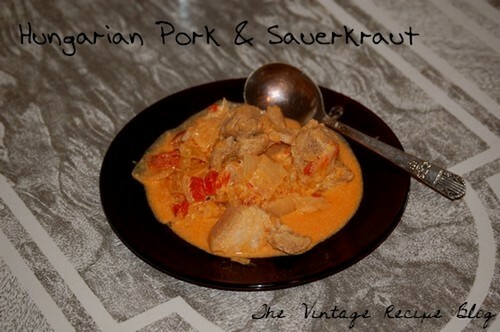 My Polish/Russian grandparents cooked a dish called Kapusta that was a mixture of pork, cabbage and sauerkraut. This dish being the Hungarian equivalent, it has some differences though. The addition of tomatoes gives it a sweet kick to counter the vinegar taste of the sauerkraut and all is brought together with the ever present sour cream at the end. This dish is more of a stew than a main dish and is best served in a nice wide bowl. Leftovers can be frozen. For the pork, get a cheap cut of meat like a picnic ham. Use only the meaty part reserving the fat for use in another recipe. Properly speaking, this dish is a Szekler recipe which originated with the Szekely people who live in the Carpathian Mountains of Transylvania. My family descends from this group with Tamasi's being mentioned in various codexes from the 1300's as "Counts of the Szeklers" and having fought hard against the constant Turkish invasions. The origins of the Szeklers are unclear and it is thought they are descendants of the Avars who settled in that area in late Roman times and were used as a border control by the later Byzantine Empire. When the Magyars came later and settled Hungary the Szeklers continued their border control responsibilities. This recipe is from the New Brunswick Orthodox Church Cookbook printed in 1958. Yes, you will know the people who eat yeast by their rosy complexions and giant bows they wear. After the demise of the quack medical tonics we had to start promoting something else that would be a panacea of health and vitality, why not yeast? I see these ads pop up with some regularity so there must have been a popular movement for consuming yeast, something akin to the cayenne pepper movement of the 1850's I shouldn't wonder. As for the yeast it's just normal bread yeast or in this case compressed yeast cakes as instant rise type yeasts we use today weren't available. This is another one of those Hungarian dishes I found in my old Hungarian cookbook from New Brunswick, NJ printed in the 50's. Lipto cheese is a sheep's milk cheese similar to feta but soft like cream cheese. It's nigh on impossible to find here where I live but not to worry, Neufchatel cheese is a great substitute. 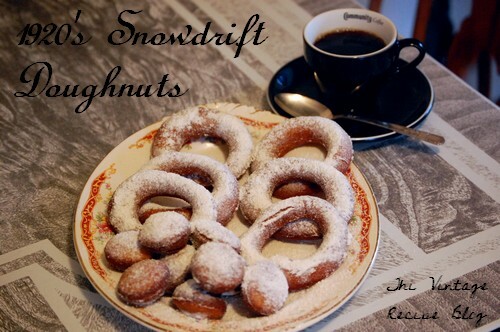 I used the Fresh Market brand of Neufchatel in making this recipe. 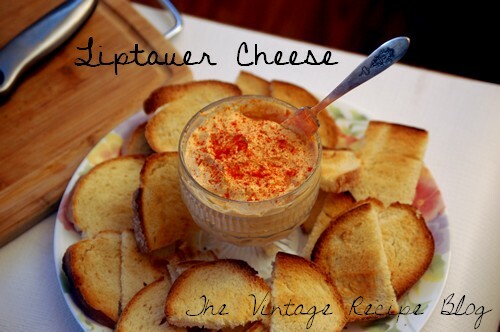 Traditionally Liptauer is a snack consumed while drinking beer. It's served on toast points usually with thin sliced of Kolbas. I used a Genoa salami instead but any kind of preserved stick pepperoni or summer sausage will work. It's best to make this a day ahead and let the flavors meld in the refrigerator.